California raisin exports have been relatively stable over the last six months, reflecting steady sales. Prices for bulk Natural Thompson Seedless (NTS) Selects has been stable and competitive with other origins, like South Africa and Chile. The California raisin industry has been shipping 5,187 packed tons per month on average to export markets over the last six months which is 33% lower than the prior year period. Export shipments have clearly not yet recovered, in part due to weaker purchasing from key destination markets for bulk California raisins. Japan, the U.K., Germany, China, and Taiwan experienced the largest decreases in tonnage imported over the last 6 months compared to the prior year period. The combination of higher prices and last year’s widespread crop damage may have provided a window of opportunity for other origins (Turkey) to take export market share from California raisin exporters. Since California raisin prices have softened since the harvest, many have expected exports to rebound to levels seen in prior years. However, March export shipments of NTS raisins showed a continuation -- not a recovery -- of slow California raisin shipments to export markets. Amid trade uncertainty due to Brexit and preference for Turkish raisins, the U.K. is down 75% or 2,169 packed tons. Germany, like the UK, also faces intense cost competitiveness and sourcing has shifted to Turkey, South Africa, and Chile in recent years. The shift was likely accelerated by the widespread crop damage to the California raisin crop in 2017 / 2018. However, in March, Germany had it’s best shipment month in the past year, importing 483 packed tons of bulk Natural Seedless raisins from California. Perhaps the more competitive price levels are bringing European buyers who have been otherwise more interested in Turkish, South African, and Chilean raisins. Though Germany had strong shipments in March, over the last 6 months, total shipments have lagged the prior year by 1,885 packed tons or 53%. China is down 49% or 1,479 packed tons, largely due to the increased tariff on California raisins which is making the product more expensive than other growing regions like Chile. Taiwan is increasing imports of California raisins but is still down 32% compared to the prior year period. Exports of California raisins to Malaysia are accelerating. In March, Malaysia imported 299 MT of Natural Thompson Seedless raisins, it’s best month in 42 months. In South Africa, sales have been slow in recent weeks. Since the prices from California are now at similar levels, South Africa is facing more competition in export markets to move their material. Both South Africa and Chile are facing this challenge as prices have become competitive between these origins in recent months. In Chile, the crop is about 2 weeks late due to weather-related reasons. Early reports from the vineyards in Chile suggest that the production of Flame raisins is 30% lower than last year. Growers are changing from old varieties of fresh table grapes to new varieties and the rate of vine pull-outs is proceeding at a faster pace than previously thought. Another challenge to the current Chilean raisin crop is that some raisin growers neglected to invest in additional inputs for their grapes in a year when such investments were even more critical due to the very high temperatures during the growing season in Chile this year. As a result, a fairly large share of the total Chilean crop -- perhaps 20% -- is of lower quality not fit for export. Buyers of Chilean raisins should be careful to deal only with reliable suppliers to receive the best quality Chilean raisins. Production of Chilean Golden raisins is down significantly compared to last year. Ovens used to make golden raisins are reportedly operating at 40% - 50% lower capacity utilization due to weaker demand from export markets. We supply all major bulk California, Chilean, and South African raisins including dried-on-the-vine (DOV) and tray-dried Natural Thompson Seedless Selects, Selma Petes, Flames, Goldens, and other varieties in Jumbo, Select, and Midget sizes and welcome your inquiries. We also supply Selma Pete DOV Double-Run Supreme raisins to Japan and elsewhere which are processed twice to achieve exceptionally low stem and capstem counts. We offer multiple packaging options including custom boxes with client branding, supplier branded boxes, and blank unbranded boxes. The U.S. China trade war is obstructing sales of California almonds to China and Hong Kong. This year, from August 1st to March 31st, exports of California almonds to China and Hong Kong totaled 105 million, down 31% from the prior year period. Last year, China and Hong Kong represented 32% of the export market for California almonds. This year, they represent only 22% due to increased tariffs on imports of almonds from California. Prices for U.S. pistachios have remained steady as consistent demand means lead times of 4 to 6 weeks currently for any new orders. Supply is available, despite the longer than normal lead times for production once a contract is signed. We supply in-shell and kernel pistachios for all sizes, grades and styles. We also supply roasted Extra No. 1 pistachios and welcome your inquiries. Continued limited availability of Whole Sweetened Dried Cranberries (SDCs) as well as increases in the cost of freight are continuing to support firm pricing. This year, there will be no USDA Producer Withholding so the artificial reduction in supply which we saw in the last 2 years which helped move the price up, will not be present this year. The trade war with China continues to complicate U.S. exports to mainland China with higher tariffs on U.S. origin, driving customers to seek offers for Canadian origin cranberries. Organic sales are going well and the latest organic cranberry crop is of good quality. Overall, we are seeing most cranberry business being done on a hand-to-mouth basis rather than forward contracting for multiple containers delivered over a longer timeline (6+ months). After Easter, European buyers will likely come back to the table to replenish their stocks of bulk cranberries for the remainder of the year. 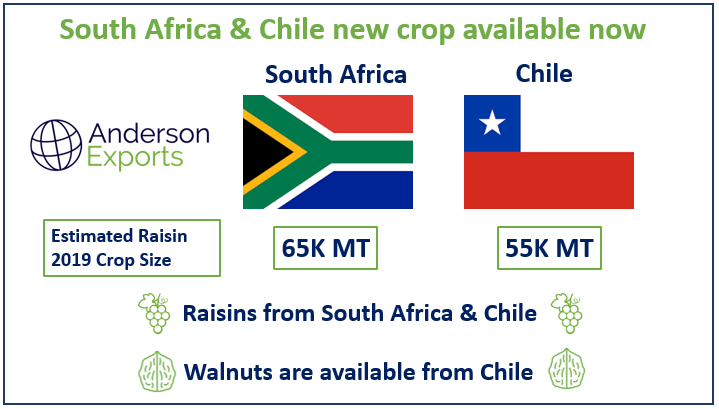 New crop raisins are available from California, South Africa, and Chile. South African raisins are being processed now with the first shipments happening in the second half of March and the first half of April. Intake has jumped up over the last few weeks and recent dry weather has been favorable for processing. The Sultana yield looks to be lower than last year, making for a total South African crop that is not likely to exceed 65,000 metric tons. Prices for South African raisins have softened over the past few weeks, following with California. In recent weeks, prices for California Natural Thompson Seedless raisins have come down. Weaker shipment numbers compared to last year at this time and slower sales are motivating some producers to be more aggressive with pricing. The current California Thompson raisin price is competitive with the current South African raisin price. California raisin packers may see larger numbers of European buyers in the market for California raisins than in recent years. Germany, the Netherlands, and the UK have almost completely stopped importing California raisins in favor of other, cheaper alternatives. Perhaps competitive prices will encourage these large and important buyers to rediscover the excellent quality California raisins are famous for. The top 3 importers of California in-shell walnuts -- Turkey, U.A.E., and Italy -- experienced growth in imports of at least 12%. California in-shell walnuts were exported to the Middle East / Africa (60%), Europe (27%), Asia (12%), and other markets over the last 6 months, from September 1st to February 28th. 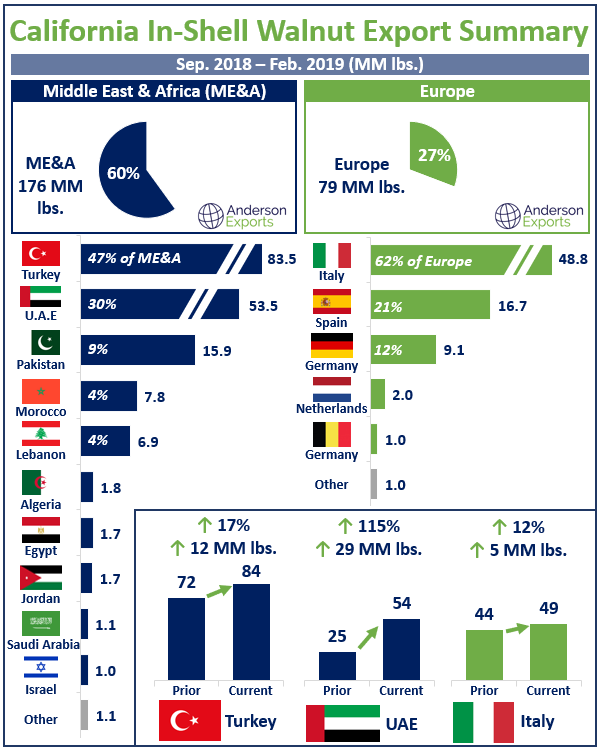 Turkey, representing 47% of all tonnage for the Middle East & Africa (ME&A), imported 84 MM lbs., an increase of 17% or 12 MM lbs compared to the prior year period. The U.A.E. reported the largest increase in tonnage (29 MM lbs) compared to last year, an increase of over 115%. Jebel Ali has been very active this year on both in-shell and shelled walnuts from California. Italy, the 3rd largest importer globally, also by 12% or 5 MM lbs compared to last year. According to the California Walnut Board, in-shell export shipments totaled 295 MM lbs., up 38 MM lbs or 15% from the prior year period of 256 MM lbs from September to February. With a later harvest this year, shipments were slower in October than past years but picked up quickly thereafter. Shipments in November, December, January and February were all stronger than the prior year. Now, California walnut packers are quite well sold and only a few miscellaneous in-shell walnut loads are available. The quality of Chile’s new crop walnuts looks good with both the size and yield looking normal with favorable conditions leading up to the harvest. The temperature during the last few weeks before Chile’s harvest tends to determine the color of the walnuts. If there is too much heat, perhaps the nuts will be darker than normal. If conditions remain favorable, the color will be light and the crop will be healthy. This year, Chile’s walnut crop is estimated to be 135,000 - 150,000 metric tons, although it will take some weeks to get an accurate accounting of the final number. Shipments of Chilean walnuts will begin over the next few weeks with early varieties like Serr available for shipment in the first half of April and Chandler shipping just a few weeks later around second half of April - first half of May. Pistachios shipments are ahead of last year and strong new planting activity this year suggests further growth to come. In 2018, 30,000 acres of pistachios were planted, making it the largest year of plantings ever. Exports of open in-shell pistachios totaled 255 MM lbs from September 1st to February 28th, up 38 MM lbs or 18% from the prior year period according to date from the Administrative Committee for Pistachios. Demand from China and Hong Kong continued to drive strong exports of bulk open in-shell pistachios to Asia. Tariffs with China were a concern earlier in the season but have not slowed down purchasing. There is only a 15% tariff on roasted pistachios for China so producers are shipping roasted product and avoiding higher tariffs. Iran, the only other major pistachio producing origin, is struggling with a weak crop due to frost damage and a challenging trade environment. With a work-around from higher tariffs and few competitors, California pistachio producers succeeded in marketing and selling a record crop. Not much has changed in the global cranberry markets over the last few weeks. Demand remains strong with many sellers reporting good sales of Whole SDC, Organic Whole and Organic Sliced SDC. Many suppliers also report that the various Juice Infused SDC products are increasingly popular with European buyers as an alternative to traditional sugar infused products. California’s almond bloom has been going well, with plenty of moisture helping to produce promising budding nutlets. It is still too early to know how the new crop will compare to last year’s crop but the weather in California’s central valley has been favorable for the bloom. U.S. sunflower prices have risen slightly over the last few months, reflecting increased costs of production and increased costs of freight. Asia is the most important export market for California raisins. Europe is declining rapidly as a key buyer of California raisins. For Europe, Turkish and South African raisins have become increasingly preferred versus California raisins. With the rise of Aldi and other discount grocery chains in Europe has come heightened cost competitiveness. With pricing always top of mind, many European buyers are hard-pressed to choose premium California raisins over cheaper product from Turkey, South Africa, and Chile. In addition to the cost advantages of these alternative origins, shorter transit times and lower freight costs make these origins even more attractive to European buyers. In Asia, the appetite for California raisins is much stronger. Japan continues to be the world leader in California raisin purchases with an increasing share of the total California raisin export market. Japan’s share of the total California raisin export market excluding the U.S. and Canada increased from 30% in 2017 to 38% in 2018. As European buyers move away from sourcing raisins from California, other buyers in Asia are increasing their share of California raisin imports. Imports of California raisins by the UK and Germany were stable for a number of years but have recently plummeted. Japan, on the other hand, has rebounded to almost the same level as prior years. Japan’s recovery is especially notable considering the smaller total available inventory versus prior years as widespread crop damage in 2018 led to a record-low carry-in for 2019. After Japan, the strongest and most stable markets in Asia are China, Taiwan, and South Korea. While Europe looks for cheaper raisins from other origins, Asia is the rising star for California raisin packers. With growing populations and incomes, many developing markets in Asia are showing sustained increases in imports of California raisins. Indonesia and the Philippines are both growing markets for California raisins and are island nations with massive populations of 264 MM and 105 MM, respectively. Global demand for California raisins remains high. No single origin is capable nor well suited to serving all raisin markets. We anticipate strong shipments to Asia after the conclusion of the Lunar New Year holidays. With the in-shell season now nearly over, many California walnut packers are transitioning to kernel production. In the beginning of the season, there were widespread concerns due to trade wars between the U.S. and major in-shell walnut markets. Due to this uncertainty, both initial demand and initial prices were weaker than previous years. As prices went lower -- within a very short amount of time -- buyers seized the opportunity, and booked almost all of the available tonnage of in-shell California walnuts. Due to the purchasing wave, many suppliers across California are completely sold-out of Chandler in-shell walnuts and Chandler kernel. In this tightly supplied market, there will only be walnuts available on a limited basis depending on the supplier’s sold position. China is a growing market for sweetened dried cranberries (SDCs). During the Chinese New Year, the color red is especially prized for good luck and success in the new year. Chandler walnut prices are rising in California. The Chandler variety is the most sought after and due to the shorter-than-expected crop and strong demand and shipments, there is now only very limited supply available. Demand for Chandler in-shell in recent weeks has been particularly strong from the Middle East, where importers are eager to receive shipments ahead of Ramadan, now just a few months away. Many packers are finished with in-shell altogether while others have some non-chandler varieties available. Due to the shortages of Chandler, many packers are cracking the Howard variety for light walnut halves and pieces (LHP). California in-shell walnut shipments in December were extremely robust. Coming in at 55MM lbs., the figure exceeded last year by 54% and prior years by a substantial margin. After a slow start to California in-shell walnut shipments -- largely due to the delayed harvest this year -- shipments rebounded considerably in December. For September and October, total in-shell shipments lagged the prior year by 24% but after the strong shipments in November and December, total shipments are down only 3% versus last year. The top in-shell markets receiving less tonnage compared to last year include China + Hong Kong (12.5 MM lbs), India (6.1), Vietnam (6.1), USA (3.2), Germany (2.6) and Spain (1.3). So far this year, tariffs and trade uncertainties are clearly weighing heavily on Asian in-shell walnut imports this year from California. The U.A.E. is posting strong in-shell shipments compared to last year which we expect to continue in the coming months for pre-Ramadan stocking. Turkey and Italy are both just ahead of last year’s shipments from September 1st to December 31st. Pakistan, up 468%, is serving as a conduit to India so importers can avoid expensive tariffs on Indian imports of California in-shell walnuts. Together, India and Pakistan have imported 21 MM lbs, up 15% over last year so the demand in the region continues to be robust. On the kernel side, total shipments are stable. 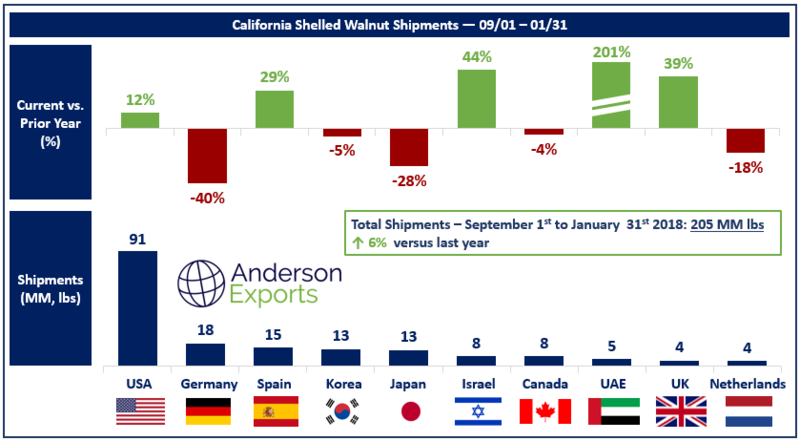 According to data from the California Walnut Board, shelled shipments from September 1st to December 31st totaled 158 MM lbs which is down only 1% versus last year. Germany is posting historically weak numbers on shelled as well as in-shell imports of California walnuts so far this year. Compared to the prior year period, Germany is down 47% or 11.2 MM lbs on shelled California walnuts. Chile may be playing a more significant role in European markets as the Chilean walnut crop grows in size and the origin is better positioned to serve German and other markets. Bulk California raisin shipments totaled 16K MT in December 2018, which is stable on a month-over-month basis based on data from the Raisin Administrative Committee (RAC). Export shipments in December were relatively strong at 5.6K packed tons, up 19% compared to the prior month and marked the strongest month of export shipments for the new crop. On the domestic side, December shipments totaled 10.2K, which is down 12% compared to November and 3.5K from domestic shipments of 13.7K in October. So far, from August 1st to December 31st, California Natural Seedless raisin shipments totaled 79K which is 35% lower than last year when shipments totaled 122K over the same period. In the Sweet and Dried Cranberry (SDC) markets the tariffs that have created hurdles for some of the other major commodities from the United States have had little effect in slowing China’s growing appetite for these sweet berries. Similarly, Canada and Chile are likely to see increasing demand for cranberries due to the ongoing tariff escalations between the USA and some of its major export markets. We have seen continued upward pressure on prices for conventional sliced SDCs over the past few months with little relief likely in the near term. SDC producers are very much in the driver’s seat this season with many opting to sell their berries at higher prices than we have seen in a number of years. It seems the supply and demand dynamics that the USDA volume regulation was meant to address may have had some effect in stabilizing the price of sliced Sweetened Dried Cranberries. This more stable market position should keep prices high for the foreseeable future. Next year, if the USDA volume regulation is not needed and the tariff situation between the United States and China becomes more favorable, global demand is likely to still keep pace with global supply for sliced Sweetened Dried Cranberries (SDCs) which will in turn, continue to support higher prices. In California almonds, the latest Position Report showed December shipments of 199 MM lbs in 2018 vs. 204 MM lbs in 2017, down approximately 2%. There was an almost 10% decrease between the carry-in as of August 1st compared to last year. Lower carry-in was offset by increased planted acreage which has resulted in a total supply for this crop year that is only down about 1% or 40 million lbs. Total committed shipments in December for exports were notably down about 17% vs last year while domestic committed shipments for December were up 5% compared to last year. Purchasing demand is likely to remain strong for the next few weeks as producers continue to ship and sell the 2019 crop in earnest. Inventory available for prompt shipment and forward contracting. Bulk Natural Thompson Seedless raisins and other California raisins are now being packed and shipped from the new crop. We have seen stable prices in recent weeks thanks to a robust California Thompson Seedless Select (NTS) raisin crop with exceptional quality. Compared to this time last year, there were no major rain events during the most important parts of the raisin harvest in California this year. We have seen strong demand from Japan and the APEC countries as we enter the Lunar New Year purchasing period. Although there remains strong demand in much of the APEC region, Chinese buyers are notably hesitant to jump into the market at current prices due, in large part, to anxiety created by the ongoing US / China Trade War. As for quality, early reports from the fields indicate a robust and delicious 2018 raisin crop; in stark contrast to the innumerable quality issues faced by buyers and suppliers during the 2017 / 2018 harvest season. Many suppliers who make Jumbo and Select size Golden raisins are reporting a shortage of Jumbo Sizes with many unable to offer Jumbo Golden raisins at this time. California’s crop of Jumbo and Select (Medium) Flames looks to be of excellent quality with an average number of Jumbo and Select (Medium) Flame raisin sizes. Prices for California Flame raisins in 2018 are higher than last year thanks to the steadily growing global demand for this delicious raisin. The Raisin Bargaining Administration (RBA) and it’s eleven signatory packers have agreed to a one year price per ton. This will not have much effect on pricing at this stage in the harvest since most packers have already been shipping raisins from the 2018 crop. The biggest news in California walnuts this week is the continuous flow of reports from suppliers indicating a shorter than expected Chandler crop in 2018. Suppliers around the state of California are reporting that the Chandler walnut crop is down, especially in the north, where some estimate the crop to be down 10 - 15% compared to last year. In addition to this shorter crop, many suppliers are observing that Chandler walnuts in general are seeing lower average meat-yields compared to both last year and the 10-year average. These new revelations will no doubt affect the prices moving forward for in-shell Chandler walnuts. The impact of the shorter Chandler crop, coupled with the lower-than-average meat-yields will remain to be seen as the season progresses. Lower average meat-yields may motivate suppliers to crack out more of their Chandlers, as they can control the final product with high-tech sorting far more than for raw in-shell. The news is not all bad for Chandler walnuts though, the product that has been received from the fields, despite the lower meat-yields, is a gorgeous light milky off-white color. Many suppliers are reporting good light color and average meat-yields for in-shell Howard walnuts for the 2018 crop. Howards are harvested earlier than Chandler and on average have a higher meat-yield. This makes it a good alternative to Chandler for those buyers who require higher average meat-yields at a more competitive price. News from the bogs continues to affirm the possibility of a smaller than expected new cranberry crop. Wisconsin cranberry production is expected to be down and there are some concerns about rot in Massachusetts. Though it is still early to tell, the decrease compared to last year may be in the 12 - 18% range. Since the cranberry market is already tight on fruit, lower new production may compound the already widespread shortages in the market for Sweetened Dried Cranberries (SDCs). There is also the wildcard of the 25% Producer Allotment (supply reduction) still in play since the USDA has yet to approve the proposal. Current lead times on Whole and Sliced SDCs remain long and prompt shipment loads are few and far between. Given these conditions, we anticipate firm prices with modest increases throughout the year for SDCs. The new California pistachio crop looks excellent though we are seeing size ranges widen as suppliers work to accommodate to the smaller than average nut size coming out of the fields. We are seeing offers on US Ex. #1 21-25 as a 21-26 or even 21-27. The demand for California pistachios dwarfs the supply so we expect tight availability and firm pricing in the year ahead. California is also in an advantaged export position this year relative to Iran due to Trump’s regime of sanctions on the country and the campaign to make it harder to do business with Iran’s counter-parties. Overall, California’s pistachios will be highly sought after so buyers would be prudent to engage early to secure their forward needs. We are now supplying new crop in-shell and shelled pistachios of all major types and sizes. China’s apple crop is experiencing major disruption due to crop failure and regulators shutting down apple production facilities due to environmental concerns. We have heard estimates of a crop reduction in the 30 - 35% range and prices are reacting accordingly. Disruptive ripples are flowing downstream to importers who are understandably concerned about how securely their forward apple needs are covered. Some Chinese suppliers are unable to fulfill contracts and others are opting to re-negotiate. Suppliers who will offer may be hesitate to lock a price for 12 months given the volatility. We are engaging new clients of dehydrated apple dices in the wake of these supply disruptions and are eager to supply dehydrated apple dices with or without sulphur dioxide (SO2) from our BRC supplier in China as well as our suppliers in South America this year. Supply of dehydrated apple dices from South America will not be available until April / May 2019 when the new crop is processed and ready for export. We supply with Granny Smith, Red Delicious and other varieties in dices / cubes of 5 x 5 x 5MM, 10 x 10 x 10MM and other sizes upon request. 100% pure liquid honey (HN 80) Is obtained from the Western Honey Bee (Apis Mellifera) in the region of Campeche, Mexico. This region is recognized worldwide because of the high quality honey that is produced there with flavor that comes from the region’s endemic wildflowers. We have both organic and conventional coconut sugar. Our suppliers of organic coconut sugar are renowned for a product with 99% purity (checked by carbon isotope analyzer). Our suppliers are fully certified, halal, kosher, fssc and USDA organic. We can also supply other coconut products, like coconut water, coconut water powder, coconut milk, coconut milk powder & more. California raisin prices are stable for the new 2018 crop and forward contracting is underway. Buyers are finding some relief in the relatively lower prices compared to the higher prices for last year’s short and rain-damaged crop. Foreign buyers are also eager to renew California raisin shipments to their markets. Export shipments of California Natural Seedless raisins were down 59% in August compared to the prior year, according to data from the Raisin Administrative Committee (RAC). Weather has been favorable and quality is expected to be strong for California raisins this year, avoiding the quality issues and short supply experienced last year due to rains during the harvest. We anticipate shipment volumes to recover to normal levels in the coming months since much-anticipated new crop shipments will begin this month. We expect the total supply of California raisins to be approximately 335K MT, consisting of ~260K MT from 2018 production and ~75K MT from 2017 carry-over. While production recovered compared to last year, total supply is relatively unchanged due to the lower carry-in. The carry-in to 2018 is only ~75K MT, which is 44% lower than the 5-year average carry-in for California Natural Seedless Select raisins. As much as 50K MT of the industry carry-over may be held by Sun-Maid and destined for retail, not bulk raisin export markets. Planted raisin acreage is also in a state of steady decline due to raisin vine pull-outs as farmers plant walnuts, almonds, and other crops. We have seen exceptional quality from California’s new raisin crop as early loads come in from the fields. In 2019, we expect Asia to continue to displace Europe as the world’s largest export market and Japan to be the largest importing country. Asia has a growing middle-class consumer base which has increasingly more access to, and ability to pay for, imported California raisins. Increasing penetration of e-grocers will not only educate consumers about California raisins, but also introduce California raisins to ever larger consumer audiences in Asia. We have seen our strongest demand for California raisins from our own customers in Japan, China, Taiwan, South Korea, Singapore, Thailand, and the Philippines. We supply all major bulk California raisins including dried-on-the-vine (DOV) and tray-dried Thompson Seedless Selects, Selma Petes, Flames, Goldens, and other varieties in Jumbo, Select, and Midget sizes. Amid weaker prices and record global supply, California walnut handlers face a challenging year ahead. The graphic below illustrates the growing production and acreage of the California walnut industry, based on data from the USDA. Walnut acreage in California and in other regions is on the rise. California anticipates a crop of 690K Short Tons, which is an all-time record. Chile will have carry-in for the first time ever. China also continues to grow a massive crop in the range of 800K MT, which is consumed domestically. Growth in the supply of walnuts is increasing due to production increases in California, China, Chile, and in the Baltics. Contracting volume early this year is especially important for California’s in-shell-only packers since they do not have the ability to crack their walnuts themselves. In-shell-only packers who miss the inshell selling season this year because they “want to hold off the market and wait for prices to come up” or “protect their brand” will find themselves in a dire situation if prices remain weak. There is a silver lining here: an extended period of lower prices and growing supply may build up new destination markets for California walnuts. As prices come down, previously inaccessible markets will be opened and new consumers will be introduced to California walnuts as a delicious and nutritious ingredient. Introducing new consumers to California walnuts will in turn increase the overall demand. Increasing overall demand will ultimately help to rebalance the oversupply and buoy prices. All varieties are coming in slightly later than expected this harvest season. Some growers and packers are seeing a slight increase in edible yield due to a general lack of tip-shrivel. Howard, Hartley, and other early varieties are being received now, with the expectation that first receipts of Chandler will begin to come in off the trees this week or next. Please let us know if you have a current need, or would like to book forward contracts for, Jumbo and Jumbo / Large (J/L) inshell Chandler, Howard, Hartley, Vina, Tulare, Serr or any other California walnut varieties. Many customers have also booked contracts for Chandler and Non-Chandler LHP 20%, 40%, 80%+, and more. We can also provide Bleaching for inshell products and vacuum-packing or nitrogen pillow-packing for shelled products. In preparation for the 2018 cranberry harvest season we visited Wisconsin, the largest production region of cranberries in the U.S. The weather has been favorable and the crop is coming along nicely. With cool evening temperatures and warm humid days this summer, our Wisconsin growers are reporting excellent sugar maturation leading up to this year’s harvest. Supply remains tight due to shortages of sweetened dried cranberries (SDCs) due to last year’s small cranberry crops in the U.S. and Canada. Lead times remain long and material for prompt shipment is increasingly hard to find with most packers holding off the market or offering at premium prices for forward shipment, if at all. The industry still awaits the USDA’s volume regulation decision, which may further constrain supply. Some packers will have periodic availability for prompt shipment although most will only be booking for shipment in 2019. Our visits to Wisconsin cranberry bogs and the processing facilities for whole and sliced SDCs can be seen in the graphic below. During this trip, we gained further insight into the mechanics of SDC production. We highlight below the key methods and processes involved in bringing you the world’s best quality sweetened dried cranberries. The cranberry harvest occurs in the late fall months, after which cranberries are frozen prior to processing into the first SDCs available for shipment in December 2018 or January 2019, depending on the packer. New crop cranberry shipments, unlike almost every other dried fruit or nut product, DO NOT begin promptly after the receipt of the new crop cranberry harvest. In fact, once harvested, cranberries are first put into cold storage where they are left to freeze solid over several months. The freezing process prepares the fruit for eventual SDC production. All freshly manufactured SDCs are made from fruit that has been frozen for at least several months. “New Crop” for SDCs is therefore somewhat of a misnomer as all SDC products are processed exclusively from frozen fruit and this freezing process takes many months. Once a new lot of SDCs is produced, the product typically has a stable shelf-life of 24 months. Please let us know if you have a current need, or would like to book forward contracts for, Organic or Conventional Whole or Sliced Sweetened Dried Cranberries (SDCs). We also supply 50 Brix and 65 Brix cranberry concentrate, shipped in bulk 55 gallon drums. The almond market is on hold as the talk of California type varieties coming in short continues. Suppliers are also awaiting the position report which will come out next week. All major California Almond varieties will be available to ship in the coming weeks as many buyers are beginning to book their forward inventories. Our most popular almond varieties are Nonpareil, Independence, Butte/Padre, and Carmel types with the most popular grades of Supreme, Extra, Standard 5%, and more. We visited multiple raisin processors in the Central Valley of California this week to discuss the new crop and forward pricing for the 2018 California raisin crop. The vines are no longer resting this year and weather has been favorable so bunch counts are up significantly compared to the prior year. In one raisin plot in Kerman, California we learned that bunch counts recovered to 34 bunches per vine this year compared to 18 bunches per vine in the prior year, up 89%. Consistent with improved bunch counts and yields, we also observed substantial increases in the number of trays per row compared to last year, which is of course another positive indicator for the new crop. There is no rain or adverse weather in the 15-day forecast so the quality of the new raisin crop should be exceptional. Despite the rebound in production, total supply will be relatively unchanged compared to last year due to the record low carry-in. For 2018, we expect total supply of approximately 335K MT, consisting of ~260K MT from 2018 production and ~75K from 2017 carry-over. The total supply for bulk raisins is probably even lower since as much as ~50K MT of the industry carry-over may be held by Sun-Maid and destined for retail, not bulk raisin export markets. Pricing for 2018 crop bulk California raisins is opening at reasonable levels. Customers buying at expensive prices for 2017 crop over the past few months are finding some relief in the lower prices for the new 2018 raisin crop. Opening prices are generating new contracting momentum and also leaving room for steady price increases throughout the season, which is ideal for processors and foreign importers. Demand for new crop from foreign markets in Asia should be particularly strong as shipment numbers from California have been significantly below normal in recent months. Shipments of California Natural Seedless raisins to export markets totaled only 4,192MT in August 2018, 59% lower than the prior year period. We anticipate stable and slowly rising prices for bulk California Thompson raisins. California’s new crop raisins are of excellent quality and as the harvest gets underway, we believe it is important to inform our buyers of California’s key raisin products and their differences. The graphic below shows the primary attributes of California’s two most commonly exported raisins: Thompson Seedless (Tray-Dried) and Dried-on-the-Vine (DOV). It is important to note that the distinction of DOV specifically describes the drying / harvest process, not a difference in variety as a single variety of grape can be either tray-dried (Thompson Seedless) or Dried-on-the-Vine (Thompson DOV). As California comes to market with extremely high quality fruit, Turkey is grappling with unprecedented currency volatility. In this unknown environment, forward contracting in Turkey with high confidence is all but impossible. Based on the extent of recent swings in the Lira, currency movements of a single day can ruin an otherwise profitable raisin contract from Turkey. The extent to which this instability will incentivize Turkish raisin buyers to reconsider their supply sources remains to be seen. To be sure, price motivations have clearly dominated many European buyers’ shift to Turkey but if currency issues persist or quality problems arise, some buyers may reconsider. We are pleased to present the following product showcase for Selma Pete DOV Double-Run Supreme raisins. The California walnut new crop is developing well. The weather has been ideal with the harvest underway for the early varieties of Vina, Serr, Howard, and Hartley. California packers are receiving a smaller than usual number of forward contracts vs this time last year. Opening prices are low with processors aware that it is a buyers market right now. Processors also know that seasonal demand from Europe and the Middle East are not yet fully expressed in the market price. Some processors may be keen to get forward business on the books at the current low prices while other larger processors are not anxious to undersell what is shaping up to be an excellent crop. Chandler inshell will be available to ship in the first half of October. Early varieties such as Vina, Serr, and Hartley are already being received by California walnut processors. Jumbo and Jumbo / Large Hartley Bleached, Jumbo Howard, Jumbo Chandler, and Jumbo Large Chandler available for booking. Prices remain high for sweetened dried cranberries (SDCs) as supply remains tight. With extremely limited near-term availability, there is no spot market for prompt shipment from origin. Though the new crop is developing well, anxiety still surrounds the possibility of the USDA’s approving a 25% volume reduction across the U.S. cranberry industry. We supply organic and non-organic whole and sliced sweetened dried cranberries (SDCs) from Wisconsin, Massachusetts, and Canada. California Almonds are on track to hit a record breaking crop for the 2018 harvest. Early indications suggest that the nonpareil crop may be short. Our recent visit to California’s Central Valley reaffirmed reports that this almond crop is of very high quality as the first field-run product is received by processors for packing. All major California Almond varieties will be available to ship in the coming weeks as many buyers are beginning to book their forward inventories. Our most popular almond varieties are Nonpareil, Independence, Butte/Padre, & Carmel types with the most popular grades of Supreme, Extra, Standard 5%, and more. According to a report by Daniel Sumner and Tristian Hanon from UC Davis published in August 2018, the share of pecans shipped to countries with retaliatory tariffs on the U.S. (~22%) is higher than the share of walnuts (~14%), almonds (~13%), and pistachios (~13%) shipped to markets facing increased tariffs. The report, which assesses U.S. fruits and nuts found that the trade losses may total to $2.64 billion per year using the export value lost as a measure. California walnut production is estimated at 690K MT, up 10% from the crop of 630K MT last year according to the 2018 California Walnut Objective Measure Report released by the USDA. The data indicated an average nut set of 1,176 per tree, up 3.1% from the 2017 average of 1,141. Sizing data came in small -- all of the sizing measurements were below the prior year levels. Although there were some concerns that rains in the late spring would damper the crop, it turned out to the contrary: cooler conditions increased kernel size and improved quality. All told, California is on track for a good walnut harvest which will kick-off in the middle of this month. For those buyers who are looking for the best potential for high quality inshell, we recommend sourcing your product from the world renowned Linden area, which grows some of the highest quality and most sought after nuts in California. Up and coming regions with increasingly higher quality production also include the Northern areas of Chico and Yuba City. The rise of these growing regions is in no small part due to the climatic changes caused by the increasing pressures of warmer average temperatures seen over the past decade in California’s Central Valley. These higher temperatures create risk of sunburn, infestation, and issues of water availability. Fortunately for California’s walnut industry, Northern California has reliable water resources and a more mild climate, ideal for growing these incredibly healthy nuts. The cranberry harvest is now only a few weeks away. The 2018 cranberry crop is expected to be normal which will likely register as a year-over-year increase compared to 2017 when production was down in the U.S. and Canada. While production is expected to recover, total supply for 2018 / 2019 will be similar to this past year due to lower carry-in and the USDA volume regulations. The potential for the 2018 handler withholding to pass provides further runway for higher prices for sweetened dried cranberries (SDCs). The Cranberry Marketing Committee meeting in mid-August provided further clarity on the handler withholdings (supply reductions). The USDA ruling which approved the Cranberry Marketing Committee recommendation to impose a 15% handler withholding on the 2017 crop is being enforced. In total, an estimated 792,000 barrels of cranberries will be removed from U.S. inventories as a result of that ruling, which is about a 7% reduction versus a normal harvest. Since the 2017 crop was down due to natural causes, this artificial supply reduction compounded supply tightness. Amid strong global demand for SDCs, prices have doubled compared to a year ago and show no signs of reversing in the foreseeable future. The 2018 handler withholding remains a wild card for the cranberry industry. The USDA has still not released the final ruling and producers are frustrated as the consequences of this decision are far-reaching. At the Cranberry Marketing Committee meeting in August, the guidance from the USDA was to proceed with the assumption that the USDA will publish a final ruling consistent with the proposal issued in April. Based on that proposal, it is estimated that the 2018 handler withholding will remove 1,275,000 barrels of cranberries from U.S. inventories, which is about a 12% reduction versus a normal harvest. Given that the market is already extremely tight, the passing of the proposed handler withholding for 2018 would likely give prices further upward momentum. For buyers with uncovered SDC needs for the fourth quarter 2018, we have some limited availability and would advise reaching out before the production slots are filled up. Given how much prices have come up in the last year, many customers have responded by covering on a hand-to-mouth basis with single loads here and there. This tendency to buy spot instead of through forward contracts may prove to be a costly strategy if forward material is not contracted and the 2018 producer allotment passes. We supply sliced and whole sweetened dried cranberries from Canada and the U.S. and welcome your inquiries. Yesterday the Raisin Bargaining Association sent out a letter stating the field price offer to packers for the 2018-19 raisin crop. The price offered is the highest in the history of California Raisins and reflects the very low inventory position and the reduced acreage producing raisins. The inventory as of August 1, 2018 was approximately 79,000 tons. This is a reduction of over 40,000 tons from August 1, 2017. Based on this, the growers would need to produce 40,000 more tons than they produced in 2017 just to have the same available tonnage. Weather conditions during the harvest have been exceptional and most in the industry are very optimistic that the crop will be of excellent quality. With the 2018 California raisin harvest underway, buyers are eager to lock-in new crop contracts. California raisins are known for being the highest quality in the world due to experienced farmers, ideal growing conditions, advanced processing equipment. Natural Thompson Seedless Select raisins are the most sought after raisin variety and size. With shipments of California Thompson raisins down substantially compared to last year, buyers have been covering with other regions -- namely, Turkey, Chile, and South Africa. When the new crop becomes available in the coming weeks, we expect monthly shipment numbers to rebound. Prices will likely remain firm even if the new crop is normal due to extremely low carry-in. From California, we supply Thompson Seedless, Selma Pete, Fiesta, Zante Currant, Flames, Golden Seedless in Jumbo, Select, and Midget sizes and welcome your inquiries. The new nonpareil crop is rolling in and early reports suggest that sizing is a little small. Of course, these are preliminary reports so the extent of the issue remains to be seen. Nonetheless, this week, many almond suppliers were off the market or only offering “safe” pricing way above the current market. With tariff uncertainty compelling many buyers to stay on the sidelines, forward contracting activity is lagging prior years. However, global demand for almonds is robust and we expect the market to pick-up soon as new crop shipments become available. Trump’s trade war is having mixed impacts on the California pistachio industry. On the positive side, sanctions on California’s key pistachio growing rival -- Iran -- will likely allow California to take market share in the global market. On the negative side, major buyers of Pistachios are in countries such as China which are being targeted by Trump’s tariffs. As a result, retaliatory tariffs on pistachio imports from China will dampen California’s ability to serve key export markets. With the new crop on the way, the impacts remain to be seen. The incentives for Brazilian mills to produce sugar sweetener compared to ethanol is extremely low right now. Therefore, much of the cane typically destined for sugar is being diverted to ethanol. These trends are weighing on estimates for how much sugar will be exported by Brazil in the years to come. All told, even with the diversions to ethanol, Brazil is a key global bulk exporter of sugar and that role will likely remain unchanged. Particularly on vessel-load business, other countries have a hard time competing with Brazil due to the favorable cane growing conditions in the country and the sophistication and scale of the industry. Next month, soybean planting will begin full-throttle in central Brazil. Particularly due to Chinese tariffs on U.S. agricultural products such as soybeans, Brazil is in a relatively advantaged position vis-a-vis the U.S. Planted soybean acreage is on the rise and Brazil and the country is expected to continue in its role as a key global supplier of soybeans in the years to come. Full-season corn is typically planted this month in Brazil. Corn is predominantly grown in the Southern and Southeastern regions of Brazil. During this month, scattered rains are expected and warm to hot temperatures. The new crop of California raisins is developing well with improved bunch counts compared to last year and overall crop quality is looking good. At this time, we are signing up new crop contracts for earliest shipment in September and October. Even with expectations of a normal new crop for California raisins, we anticipate elevated prices due to the smaller carry-in and backlog of demand. Since the prior crop was so small, the carry-out from this season is probably going to be approx. 70 - 75k MT for California Natural Seedless Select raisins. We believe this decreased carry-in figure together with the shipment backlog -- seen in the June shipments down 39% year-over-year -- will lead to tight supply and firm prices for new crop despite normal production levels. On the demand side, there is strong appetite for California raisins from Asia, particularly in Japan. Based on monthly shipment data from the Raisin Administrative Committee (RAC), the following graphic helps illustrate the shifting export demand for California raisins. For the first time ever, Japan imported more California raisins than all of Europe over the period of August 1st to June 30th this year. Not only did Japan surpass European imports, it did so by a vast margin: 9,315 MT or 45%. We expect this robust demand from Japan to continue. Japan’s quality specifications are some of the strictest in the world and California’s processing facilities are the most sophisticated so the two regions are well-suited. Over the last few years, Europe has become a less significant buyer of California raisins, opting increasingly for Turkish sultana raisins rather than California Thompsons, largely due to the price differential. Turkey’s proximity to Europe as well as improving processing capabilities are also driving the origin-shift. The California Thompson is widely considered to be the best snacking raisin globally and will likely remain so for some time. We expect California raisin prices to remain elevated and buyers to act early to secure new crop material and welcome your inquiries for dried-on-the-vine (DOV) and tray-dried California Thompson Seedless, Selma Petes, Flames, Goldens, and others in Jumbo, Select, and Midget sizes. The USDA decision on the 25% producer allotment (supply reduction) for the coming crop is long overdue at this time. They indicated the decision would be put out in Feb/March but has yet to be released. Growers need to make operating decisions with the information about the crop allotment since the implications will be severe. Availability remains tight with no prompt shipment available. Some suppliers are completely sold out of fruit and are awaiting new crop. At this time, the new crop looks okay -- doesn't appear to be the biggest crop but should be normal. Bottom line is that the USDA holds the cards on forward cranberry pricing due to the potential for the USDA to pass a 25% supply reduction for the coming crop. This decision has the potential to drive prices higher substantially. With the earliest shipments being offered right now for September / October, and some suppliers offering January forward shipments well over $2.00 / lb. on an ex-works basis, our recommendation if you need to cover your cranberry needs prior to 2019, is to lock in contracts at today's prices. Buyer apprehension due to uncertainty over trade tariffs is causing slower new crop sales for California walnuts. Prices have come down in recent weeks for current and new crop. Walnut handlers in California are looking to reduce inventories and accelerate new crop sales so prices are coming down. The new crop is expected to be healthy with tonnage in the 680,000 MT range. Though tariff-related uncertainty may persist for some time, we do expect order activity to pick up after the Objective Walnut Estimate is released later this month. The California Agricultural Statistics Service (CASS) Objective Estimate will add some clarity on the new crop. Howard, Hartley, Bleached Hartley, Tulare, Vina, and Serr varieties of inshell walnut will be harvested first, with Chandler quick to follow. We are currently marketing new crop inshell Jumbo and Jumbo / Large Chandler Walnuts, please let us know your requirements. Almond prices are declining due to the tariffs effect of weakening demand. China's tariff added a 50% tax to California almonds. Prices have come down approx 10% recently due to the bumper crop expected amid lower demand due to escalating trade tensions. As another setback for U.S. almond growers, China has closed a trading loophole that for years allowed large volumes of American almonds to be transported into the country via Vietnam without incurring import taxes. China's strict treatment of smuggling is also discouraging transshipment activity to avoid tariffs. Overall, we see committed shipments currently down >50% from this time last year as an early signal of prices dropping substantially in the period ahead due to the bumper crop amid eroding export demand due to tariffs. Turkish apricot shipments for the 2018 crop are underway and quality is good. Organic and non-organic sulfured and unsulfured Turkish apricots are available in size 3, 4 and 5 are freshly processed and packed. With production for the 2017 / 2018 harvest estimated in the 140,000 MT range, Turkey is by far the largest producer of apricots globally followed by Iran (32,000 MT) and Uzbekistan (10,000 MT). Weak sugar prices continued in recent weeks as world market surpluses rose further. Earlier this year, record production from India and Thailand worsened the oversupply situation. Production in the E.U. is also growing after production quotas expired in October 2017. The E.U. faces an extremely competitive export market with global production so high and prices so low. In recent weeks, heavy rains in the Center / South Brazil slowed the sugarcane crush. Wetter weather is known to negatively impact cane quality and incentivizes ethanol production since juice quality deteriorates. We supply Brazil origin ICUMSA 45 Sugar by the vessel on a spot (MOQ: 50,000 MT) or forward contract basis including long-term contracts of 300,000 MT / month x 12 months. Payment by SBLC, BG, or DLC from global top 50 bank. As Trump escalates the trade war with China, Brazil and Argentinian soy farmers are seizing the opportunity to increase production. The USDA raised its 2018 / 2019 Brazilian production forecast to a record 120.5 MMT driven by higher planted soybean acreage. Higher freight rates in Brazil are continuing to negatively impact Brazil’s soybean industry. Due to higher inland freight costs as a result of the labor disputes, fertilizer deliveries to Brazilian soybean growers have been delayed. Some growers have reported a rise in fertilizer and pesticide costs of 20% ahead of the 2018 / 2019 crop cycle. Higher fertilize prices will weaken grower margins and may lead to lower fertilizer application rates. In turn, reduced fertilizer and pesticide application rates may depress yields in the years to come. Despite near-term challenges, global demand is growing for soybeans and Brazil is extremely well positioned to serve increasing global demand. We supply GMO and Non-GMO certified Soybeans from Brazil. MOQ: 50,000+ MT. Payment by SBLC, BG, or DLC from global top 50 bank. Expectations for Brazil’s safrinha corn production fell in recent weeks. Many believe the lower production figures will be reflected in lower volumes of Brazilian corn exports. Reduced production is causing prices to go higher. Estimates for Brazilian production are in the 80 MMT range. Globally, corn inventories are falling faster than expected which is also firming prices. The global stocks to uses ratio is in the 13% range which is the lowest level in recent years. We supply GMO and Non-GMO certified Corn from Brazil. MOQ: 50,000 MT. Payment by SBLC, BG, or DLC from global top 50 bank. We work with a number of other products so please reach out if you have an inquiry for something you do not see here. Some of our other product offerings include sunflower seeds, lentils, green peas, freeze dried fruits, popcorn, dried cherries, dried apples, dried blueberries, cherry concentrate, quinoa, dried honey dates, dried cherry tomatoes, dried gojis, dried kiwis, dried strawberries, chickpeas, chia seeds, dried mulberries, almonds, macadamias, pistachios, walnuts, cashews, pinenuts, pecans, brazilnuts, pumpkin seed kernels, melon kernels, hazelnuts, dried prunes, golden raisins, sultanas, dried apricots, sweet apricot kernels, dried blackcurrants, dried figs, dried dates, popcorns, maraschino cherries, dried tomatoes, strawberry pie filling, blueberry pie filling, cherry pie filling, dried mangoes, dried gingers, dried pineapple, and dessicated coconut.